Move over robo-cop, make room for the young, slick, finned super-cop of the ocean. Shoal, a consortium of six European organisations, has developed a new robotic fish that can detect pollution in ports and harbours. This is a combine effort of researchers on artificial intelligence (AI), robotic development, chemical sensory, hydrodynamics, and communication. 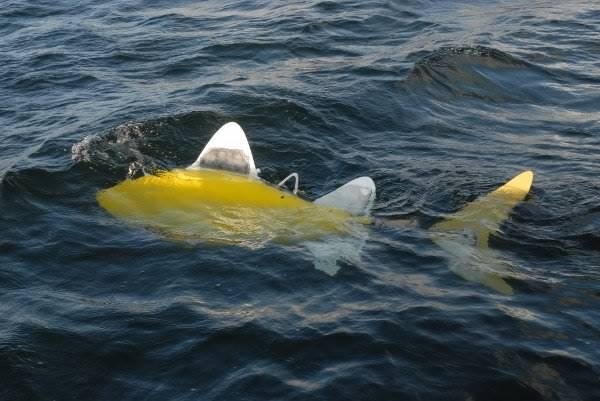 It is a 1.5m long yellow-coloured robotic fish, powered by a battery that can run for up to 8 hours before needing to be recharged. The robo-fish is fitted with a range of sensors that help it to safely navigate in the waters and it has been designed not to disturb other marine creatures. The robo-fish uses artificial intelligence to map where to go, collects and records samples, records the location of the samples and identifies their chemical composition, and communicates the information through shallow water to the base station on shore. What this robo-fish do is that it cut the detection time and analysis of pollutants in sea water from weeks to just a few seconds. Chemical sensors fitted to the fish perform real-time in-situ analysis, compared with the current time consuming method of sample collection, dispatch to a shore-based laboratory for analysis. The artificial intelligence which has been introduced means that the fish can identify the source of pollution, enabling prompt and more effective remedial action. Like all other remotely controlled equipment, Mr. Robo-fish can be improvised and used by interested parties to spy on others while doing its routine sampling works. On a lighter note, this should be an interesting toy to play around with. There is nothing impossible with current stage of technology. Fascinating, yet somewhat scary at the same time! Advantages and disadvantages when the world expanded.